Blood clot. 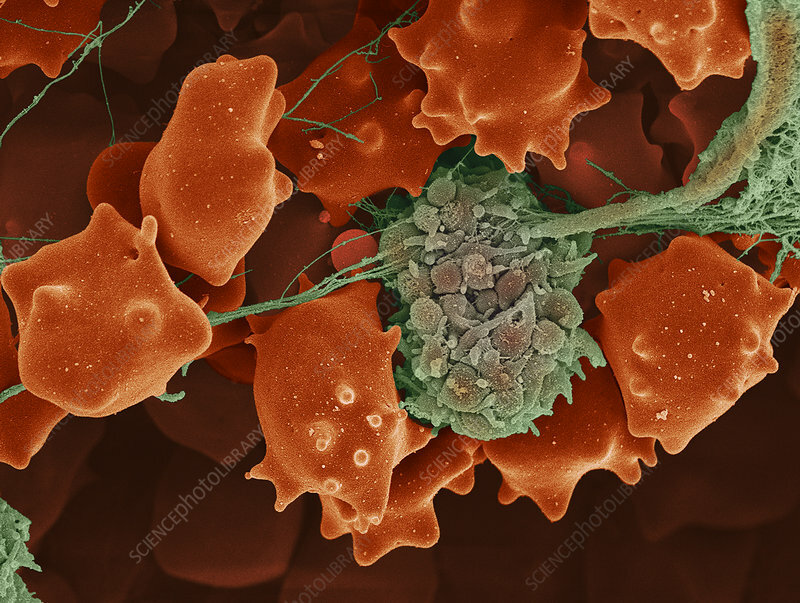 Coloured scanning electron micrograph (SEM) of a small thrombus of platelets (green) and crenated red blood cells (erythrocytes, red). A thrombus is a blood clot that forms in a blood vessel. During clot formation platelets aggregate together and may trap red blood cells in a mesh of fibrin. The red blood cells have become crenated (spiked). This may be symptomatic of uraemia (accumulation of nitrogenous waste in the blood), which causes the blood cells to become dehydrated. However, it is often the result of prolonged storage of a blood specimen. Magnification: x5000 when printed 10cm wide.